BURNABY, Canada — From the pub to the print room, the British Columbia Institute Of Technology (BCIT) Student Association is looking at all their options to reduce waste on campus. Last year, they overhauled their napkins, cutlery, cups and straws, sourcing eco-friendly and compostable options whenever possible. But they know they can’t do it alone. Key partnerships at BCIT have given them momentum as they look for opportunities to scale up their efforts. One of those partnerships is BCIT’s Green Team. Leesa Watt, a Green Team member and dedicated volunteer with the Vancouver Aquarium, was shocked to learn that in Vancouver alone, 2.6 million plastic-lined coffee cups end up in the trash each week. An avid coffee drinker herself, she was happy to receive a discount on campus for bringing her reusable mug. She did a quick calculation and realized that the average student would save $35 over a single term if they did the same. This shift, she hoped, could help reduce the millions of coffee cups that leave BCIT each year and end up in landfills and waterways. 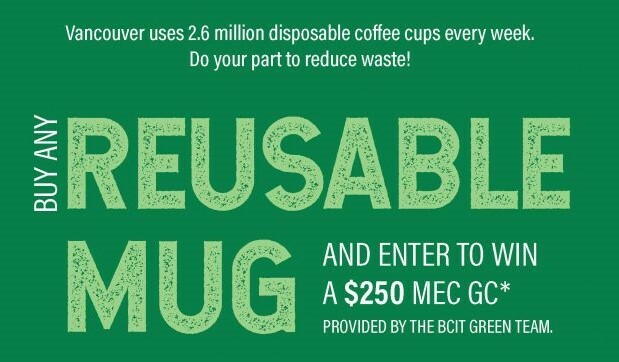 Watt and BCIT’s Green Team partnered with the Student Association, who also sell re-usable mugs, to encourage the switch. Together, they kicked off the school year with a contest, in which each person who purchased a reusable mug, was also entered in a prize draw. Watt knows that it’s easy to feel overwhelmed by disposable packaging. But she’s quick to point out that eliminating disposable coffee cups is one of the easiest places to start reducing waste.